On March 19 2018, the Draguignan court is preparing to hear a most unusual case. 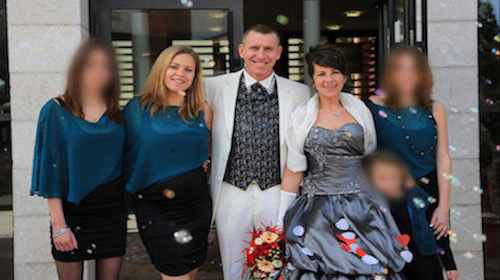 In the dock are Hervé Robino, 47, his wife, Pascale, 46, and their daughter, Roxane, 23. A family accused of murdering a rich retiree in horrendous circumstances. On July 28 2014, it’s 8AM when Bernadette Benaym’s neighbor makes a panic call to the St Tropez gendarmerie. She just discovered her friend’s lifeless body lying in a pool of blood on the terrace of her vast villa in Roquebrune-sur-Argens. The victim was stabbed several times and then her throat was cut… So, who could have begrudged Bernadette Benaym to the point of cutting her throat? For investigators, the answer lies in the private side of her life: despite her age, the widow amassed conquest of conquest, preferable young ones. Among them, Hervé Robino, her gardener. For the last year, this family man wasn’t only content to tend Bernadette’s garden… he was also her lover! However, most importantly, the gendarmes learn that Pascale, Hervé’s wife, had discovered the subterfuge and was making death threats against her rival.